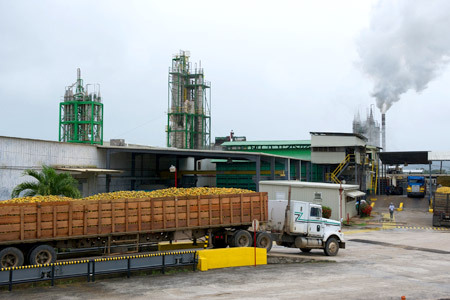 Processing the Fruit | Citrus Products of Belize Ltd.
At CPBL a series of activities and steps are involved with the manufacture of our juices, concentrates and by products from oranges and grapefruits. The descriptions below attempts to sequence these events. Citrus fruit may be unloaded either via dry system by conveying fruits to bins with sloping planes on which the product is placed in layers to protect the integrity of the fruit. Grading tables are designed in order to allow a more efficient removal of foreign materials and fruit that is unsuitable for extraction due to injury. In this stage the fruit is separated according to the sizes that best match the cups of the Citrus Juice Extractors so as to achieve the optimal quality and juice yield. Sizing is obtained by rotating the fruit along belts by a series of rotating horizontal rollers, which can easily be adjusted during operation. After sizing, the fruit is conveyed to the hoppers of the Citrus Juice Extractors by means of a feed belt conveyor equipped with the appropriate diverters. The tilted feed belt is set up at the appropriate angle to promote proper fruit feeding to the extractor regardless of fruit shape. Excess fruit is redelivered to the grading table by means of a return fruit conveyor. Whole pre-sized citrus fruit is fed into the extractor for processing. The fruit enters a hopper and is picked up one at a time by a feeder mechanism. Two opposing endless chains are each composed of fruit processing cups, which receive whole fruit from the feeder. These cups first pass by a halving knife to cut the fruit in two. They carry the fruit halves to a reaming area where the juice is reamed from the fruit half in much the same manner as a kitchen hand juicer. The reamed peel halves are then ejected from the cups allowing for the reception of another whole fruit to begin another cycle. Reamed juice from a Brown extractor contains also whole cell sacs and seeds. The juice coming from the extractors is then collected by a stainless steel juice header and then conveyed to the finisher. The various finisher types efficiently remove juice cell sacs (pulp) and seeds from the juice by using stainless steel screens with small perforations. The finisher has been developed to extract juice from products having a low fiber or pulp content further pulp reduction can be obtained by means of centrifugal separator, though this is not generally necessary. Juice concentration up to 66° Brix is obtained in the Thermally Accelerated Short Time Evaporator (TASTE) used at both plants. The basic advantage of the TASTE technology is that at each evaporation stage the juice is introduced into the tube nest in the form of a turbulent fog, enabling a much faster and higher heat transfer than would be expected under most other conditions. The juice flows from one stage to the next without recycling. This starts using a scraped surface heat exchanger (SSHE) to remove heat from pasteurize juice. The inside surface is scraped by a rotating shaft while the outside is cooled by a refrigerant. Tiny ice crystals are formed at this cold surface. Once the crystals are formed in the SSHE they enter a mixed vessel called a recrystallizer. Most of the small crystals will melt here allowing the larger ones to grow. Once there are sufficient crystals in the recrystallizer we can start to separate them from the concentrated liquid. This separation is done in a wash column. Here the crystals are separated from the liquid, washed to remove any remaining concentrate, melted, and discharged as pure water. The concentrate is returned to the recrystallizer. Fresh feed replaces the water that is removed from the system. The feed is mixed with the recirculation stream feeding the SSHE. Since the feed is replacing the water that is removed from the system the concentration of the soluble solids in the system will increase. All that is left is to add a way to remove the concentrated product. This is simply discharged from the liquid recirculation line after the filter. Since the concentrate contains all of the soluble solids originally in the feed the system will now remain constant. The concentrated juice is accurately and reliably filled into drums by means of a controlled system with preset weight scales. This system consists of a finisher to separate the oily emulsion from peel fragments. The resulting emulsion is then fed to a two-stage centrifugation system. A “desludging” centrifuge removes the suspended solids and concentrates the oily emulsion into a cream and then the polishing centrifuge completely separates the essential peel oil from other liquid phases. This System allows washing and sanitization of all parts coming into contact with the product. A special system of tanks, piping and high pressure pumps allows dissolution and semiautomatic distribution of sanitizing agents to the various lines, tanks and machines. A special system of screw conveyors takes the citrus peel as well as waste pulp and membrane material to a dedicated silo. Here the waste material can be directly discharged onto a truck or conveyed to the peel drying system for further processing. Peel drying systems are designed to reduce peel moisture content from the initial 85% to a final 12%; this allows the peel to be preserved after its volume has been reduced without altering its nutritional value as animal feed. This system includes a hammer mill, a neutralizing tank with lime dosing capabilities, presses, a rotary drum drier complete with combustion chamber, pelletizers and cooler for pellets, a dust separator, and a product filling system. The air vapor mixture coming from the rotary drum drier is separated from the powders then conveyed to the waste heat evaporator to be used as a source of energy to concentrate the liquor coming from the pressing stage. Additionally, the waste heat evaporator also recovers residual oils contained in the peels in the form of d-Limonene.